As I mentioned in earlier post, I'm currently enrolled in viticulture and enology program at the Southern Oregon Wine Institute. Part of the curriculum is geared toward exposing students, many of whom have scant knowledge about imported wines, to the broader wine world. It's a good way to give perspective, via immersion into those regions many have merely heard of before. Today's wine review feature wines from Europe, Germany, Spain and an excellent dessert wine from Hungry, two were a bit disappointing with the remainder receiving the coveted thumbs up. Part of the class involves the writing of a tasting note about the wines presented, in what I consider a rather perfunctory style, notes which are not in my typical inimitable tone and tenor found on my blog. That said I hope you'll enjoy this edition of the wine lab, three more should arrive over the next month or so. Reichgraf von Kesselstatt, 2014 Scharzhofberger Riesling Kabinett, Mosel, VDP Grosse Lager: In the glass, this wine appeared light in color, the color was a pale yellow, and the clarity was clear. This wine was nicely aromatic, but moderately so. After a few good swirls, allowing the wine to warm a bit, wet-stone, diesel, apricots and other undefined stone fruits. The wine was a bit off-dry, the acidity was low to flabby. The body was light, and the tannins levels were hardly discernable, not too evident. Flavor descriptors, more undefined stone fruit, similar to a mashed-up melody of punk rock and rap music fusion. The flavor parade continued sadly, broken, wet slate, overripe peaches, homogenized honey bear, a light note of diesel and dying floral blooms. The finish was a medium minus. Reportedly a vintage with many ‘challenges,' as noted by the winemaker, perhaps one of those challenges was producing this Kabinett. According to the back-label information, the grapes for this wine were harvested from Scharzhofberger, a famous site in the Saar. In my opinion, the overall profile of this wine was too simple, too flabby and lacked any real structure or finesse. Not recommended. Reichgraf von Kesselstatt, 2015 Scharzhofberger Riesling Spatlese, Mosel, VDP Grosse Lager: In the glass, this wine appeared light in color, with a shimmering straw core and the clarity was quite clear. Again, not an overly aromatic wine, sporting moderate aromatics; but after warming up a bit, wet river rock freshly plucked from the icy waters, fragrant florals, some petrol and a note of brininess in the background. The taste, I found this wine to be off-dry to dry, much more balanced than the Kabinett, the body was medium, and the tannin level was moderate to low. A bright vein of acid ran through the unctuous fruit, delivering a food friendly wine, with low alcohol and a modest amount of sweetness that would pair wonderfully with spicy cuisine. The overall flavor profile was pleasing, and sporting newly bloomed honeysuckle perfuming the air, a slight citrus note, summer-ripe white peaches, pears and crushed river rock. The finish was medium to long, pleasing, inviting another sip, swirl, and slurp. The grapes again were harvested from a famous site in the Saar on the Mosel River. In my opinion, the overall profile of this wine snappy and crisp, cut with enough acid to balance the higher RS of 4.5% and sported real structure and finesse. Highly recommended, an excellent representation of German Riesling. Disznoko Tokaji Aszu 2008: In the glass, the appearance is gold to amber, the color depth is light in intensity, and the clarity is clear. After a good swirl or two, and a few moments of warming up in the glass, white tea leaves, dried apricots, honeycomb, an odd vegetal note. Perhaps from the effects of Noble Rot. The overall taste profile, this wine is sweet but balanced with crisp acidity, the body is light to medium, and the tannins levels are moderate, well integrated. The flavor descriptors, orange peel citrus, vanilla, white tea, apricots, and dates. The finish is long and lasting, a wonderfully balanced dessert wine which pairs exceptionally well with pungent blue cheese. I also thought this wine would be an excellent addition to the Thanksgiving festivities after party, where they serve pumpkin pie from scratch exclusively to insiders. The details: 5 Puttonyos sweetness level, this wine is a blend of 70% Furmint, 20% Zéta and 10% Hárslevelu, and 12.5% alcohol. After the fall of communism in Hungry, Disznoko Estate was reborn, with new ownership infused cash into the dying husk of the 1772 first growth property. The vineyards which needed massive work, it was replanted; despite the replanting undertaken, it's still considered a classified 1st growth. There was much cleaning up which needed to be done; not only did the vineyards need an overhaul, but many of the buildings and winemaking equipment also required updating as well. This vineyard essentially sits on a hill of volcanic clay soils with perliter pebbles. Atop a hill in the vineyard is a boar-shaped rock, from which the name of the winery takes its name. Formally known as “a wine of kings, and the king of wines” [sounds like a Budweiser commercial] this property and its new owner help set in motion, a wave of renewal, the return of Tokaji’s reputation as a wine region to be taken seriously once more. It's a region with a rich past and now an even brighter future built upon the traditions of those who went before them. Some of the vineyard here is quite steep and held by terraces, which present their own issues regarding erosion and picking, making machine picking and even vineyard maintenance difficult. Disznoko is one of a few vineyards planted entirely on a single tract of land, making them 100 percent estate harvested, vinted and bottled. They control 100 percent of the property and have a more intimate knowledge of how it lives and breathes. The Disznoko estate has been planted with four of the six approved noble grape varieties of the Tokaj Wine Region: with Furmint leading the pack at 70% planted, while the rest Hárslevelű, Zéta, Sárgamuskotály bring the balance. 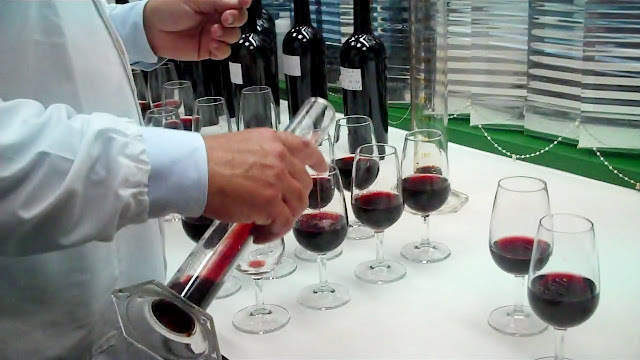 Switching gears here, with a previous wine lab, where we took a quick look at the wines of Spain. 2011 San Cristobal, Ribera del Duero: In the glass, the color depth and appearance are deep to very dark, brooding really. The color is akin to baked on, burnt red to deep purple, and at the core, it's opaque. The aromas of this wine, are off-putting, in an oddly unflattering aromatic kind of way, I thought the wine was off for a few moments, but I was incorrect. It may have suffered heat damage in transport or was left in the back of vehicle far too long. Who knows, that said the aromas reminded of stewed bell peppers, cans of asparagus left open overnight, roasted plums, burnt French roast lingering overnight in the office coffee pot. The taste, which was not pleasing, tasted dry, the acidity was more sour than balanced. The body was full; the tannins were quite firm, and not well integrated. The flavor descriptors were not much different than the aromas found in the nose, more stewed green bell pepper, charred oak, burnt coffee and sour black cherry, and plum. The finish was hot and heavy, like a zombie breathing down your neck, it lingered. This wine is a hot mess. I think opening a second bottle from a different source, it could tell a different story. Fillaboa, Albarino, Estate Grown 2015: In the glass, the color depth and appearance are light, the color is a straw to pale gold color, and at the core, it's clear. The aromas of this wine, are wonderfully aromatic, citrus, pineapple and other floral notes. The overall taste profile is dry, the acidity is crisp, the body is light, and the tannins are low. Flavor descriptor wise, freshly sliced green apple, citrus, white flower blossoms, and just a dot of honey. The finish is light and refreshing.